Villa Jacoba is one of three modern detached villas on 2 levels which is ideally situated in a flat area within just a few minutes walk from the beaches of Puerto del Carmen and resort facilities. Comfortably furnished throughout the rooms are spacious and bright. The enclosed sun terraces are surrounded by border gardens and traditional volcanic stone walls. 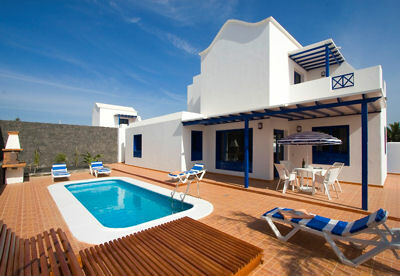 This villa is ideal for both famillies and couples looking for a relaxing holiday. Fully fitted kitchen with dishwasher, microwave, oven/hob, frige/freexer, table and chairs; comfortable lounge with satellite TV (limited channels), DVD, CD player, dining table with chairs, patio doors to sun terrace and pool; Utility room with washing machine, iron and ironing board; 2 x twin bedrooms with fitted wardrobes and fans; 2 x shower rooms with walk in shower, WC and washbasin.